War of the Maps exhibition opened on November 28th, to celebrate the centennial of the Great Union. 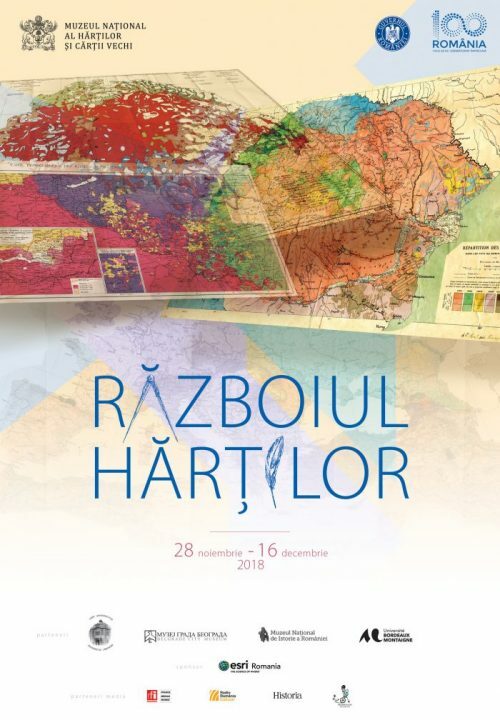 It showcases ethnographic maps made during the first half of the 20th century, maps which were used both in the press, to promote the position of the Romanian Government at the Paris Peace Conference, and by the national delegations which participated in the conference. The Paris Peace Conference, which followed the First World War, was held between 1919 and 1922. It consisted of a series of meetings between the delegations of various states, and it redrew the map of Europe based on the principle of self-determination – according to this principle, each new state would be built around one nation, which had the right to occupy the territory on which its ethnic element represented the majority. In this context, ethnographic maps played a crucial role, as the means by which the self-determination principle could be applied. The exhibition brings together a number of 14 maps from “Lucian Blaga” Central University Library of Cluj-Napoca, the National Museum of Romanian History, Belgrade City Museum – Serbia, Bordeaux Montaigne University – France, the National Museum of Maps and Old Books, and the private collection of Silviu Anghel. Among these maps there are Emmanuel de Martonne’s Répartition des Nationalités dans les pays ou dominent les Roumains, Pál Teleki’s Ethnographic Map of Hungary based on the Density of Population, Jovan Cvijic’s Carte ethnographique des regions septentrionales Yougoslaves, and A.D. Athanasiu’s Carte ethnographique du Banat de Temesvar d’après la Carte ethnographique de la Hongrie orientale, par Pál Balogh, et les statistiques officielles. Whoever seriously seeks to solve the problem of nationalities must look to the ethnographic map for a solution… wrote, as early as 1906, the Transylvanian politician Aurel C. Popovici. The exhibition open at the National Museum of Maps seeks to highlight the role played by ethnographic maps in the aftermath of the First World War. The “mirroring” display of the maps helps us understand what ethnographic maps are, why they differ, how they were made and used, and how borders were drawn with their help. The space hosting the exhibition has been conceived to display a map in its various forms and contexts. It gives visitors the possibility to discover the map not only as a material object (how it was created, the technologies and base that were used, and the production conditions) but also as a cultural one (the identity of its creator, the context in which it was created and to what purpose, as well as the social and cultural implications of its creation). The exhibition is open until December 16th. The price of a ticket is 5 lei.